After setting Division one alight last year, ending the season with a perfect record and closing the campaign with a 3-0 win over runners up, University of Limerick, DCU cemented their place back in the top flight. However, the honeymoon period has quickly dissipated. 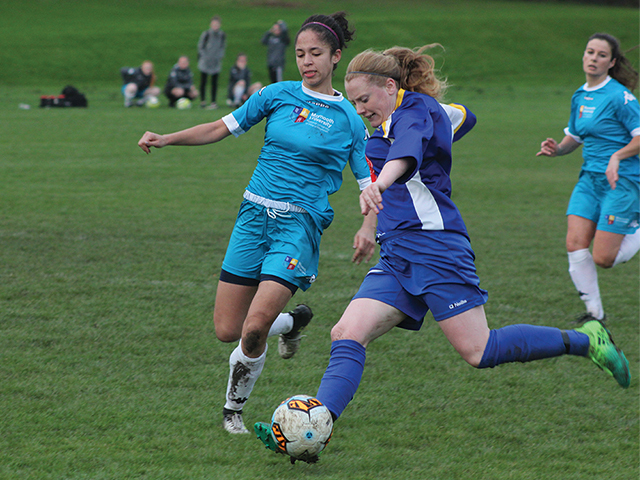 With two defeats, DCU are in unfamiliar territory and, desperate for a big result, they welcomed last years’ women’s top flight champions NUI Maynooth to St Pats on Tuesday. NUIM were the sharper team out the blocks as DCU struggled to find their rhythm early on. After only 2 minutes, Kelly picked the ball up just in DCU’s half, splitting the defence open to set Chemaou one on one with the keeper. Chemaou dinked the ball over the onrushing Byrne to give NUIM an early lead. Maynooth continued to control the game, with Kelly being at the centre of near everything. DCU gradually worked their way back into the game and began to test Dunne in the NUIM goal. A 25 yard free kick from Amber Barrett was miraculously tipped over the bar. This proved to be rather ominous as only a few moments later Barrett picked up a loose ball in the midfield which deflected into the air off a NUIM defender. In one movement reminiscing Henry against Manchester United, Barrett took one touch to set the ball up, swiveled, and volleyed the ball over Dunne’s head from 25 yards out. Having just worked their way back into the game, DCU were pegged back as Chemaou doubled her tally. Cutting inside from the left, she placed the ball tightly into the corner. However, the lead was short lived. A minute before the break Barrett again was pivotal, claiming possession in the midfield and playing a precise lobbed ball to split the Maynooth defence, exposing their high line, For Craven to pull DCU level again. Soon after the interval, DCU were put on the back foot. Maynooth capitalised on a moment of complacency in the DCU back four as Kealy slipped a ball through for Kelly to ghost into the DCU box and make it 3-2. Almost immediately from the tip off, DCU put the ball in the Maynooth box for Barrett to scramble it in for her second, leveling things once again. Soon after, Barrett found herself with only the last defender between her and the goalkeeper. After turning wide, Barrett’s shot took a deflection off the defender, nearly looping over the head of Dunne. Late on, it was a moment of brilliance that set the two sides apart. Picking up the ball in the corner, Maynooth’s McEvitt weaved her way past three defenders, finding herself on the edge of the box. There she curled the ball into the top corner, giving Maria Byrne no chance.